Have you ever given it a thought that a super expensive luxury toilet can cost you as high as £1,840 or almost US Dollar 2866! It is the Ultimate toilet for the 21st Century. Stuffed with the most number of technological advances into a small amount of space, TOTO’s innovative NEOREST has a stunning, modern low silhouette. The design results from the abolition of the tank, the incorporation of the toilet, and TOTO’s celebrated Washlet warm-water personal sanitization unit. The pearlescent finish of the lid gently reflects ambient light. This adds sense of personal luxury. The lid of the NEOREST automatically opens whenever an individual approaches it. With the gentle touch of a button on its wireless remote, the NEOREST’s seat rises automatically and a water-saving 1.2 GPF flush mode operates automatically also. 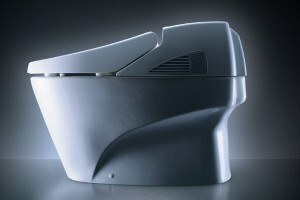 When the individual walks away from the NEOREST, it flushes automatically and the seat and lid automatically close.